You are warmly invited to come and hear stories from the latest Friends of Wadi Foquin pilgrimage to Israel-Palestine, share in a delicious Middle Eastern meal, and watch Zelda Edmonds’ powerful new documentary about Palestinian youth, "Imprisoning a Generation" (see trailer). All proceeds will be used to construct an income-generating guesthouse in Wadi Foquin. Tickets are $25 before Apr. 6 and $35 at the door. Tables of 8 can be sponsored for $185. To purchase tickets, please mail checks to Rev. Emily Lin, 1411 Oak St., Alameda, CA 94501. Make them payable to BMU-FOWF with "pilgrim dinner" in the memo line. Parking is available. Building is wheelchair-accessible. For a downloadable flier, click here. • ​Transcript of Dr. Hisham Ahmed's keynote address at FOWF's Interfaith Muslim Solidarity Dinner, Jan. 20, 2017 (Inauguration Day). Wadi Foquin is the site of a community development project supported through the United Methodist Church's General Board of Global Ministries (Advance project #3021565). A resolution supporting Wadi Foquin was passed at the church's May 2016 General Conference acknowledging the challenges of settlement expansion and recent land confiscation orders. The resolution calls for accountability from the Israeli government for the destruction of land and life in Wadi Foquin. It also calls on U.S. officials to contact the Israeli government to immediately halt the illegal Israeli settlements and confiscation of Palestinian land. Friends of Wadi Foquin's fundraising efforts in 2019 are focused on the new guesthouse project in the village. Your contributions will help fund construction of visitor accommodations on land vulnerable to confiscation, generating needed income while serving as a deterrent to further land annexation. For the people of the village, their continued existence is a form of resistance to the settlement expansion and Israeli military occupation. Each guesthouse will cost $7,000 to build. As each $7,000 is raised, a new guesthouse will be built. The goal is to build six of them. Please help us meet that goal. Your gifts can be made online through the General Board of Global Ministries Advance program (Advance project #3021565) or by check to BMU-FOWF with “guesthouse” in the memo line (mail to Jean Hart, FOWF Treasurer, 730 Tree Top Lane, Auburn, CA 95603). Wadi's Foquin's soccer field was largely funded by donations made through Friends of Wadi Foquin and the United Methodist Advance #3021565. According to community development director Ata Manasra, "It is the most important project we have done with Friends of Wadi Foquin." 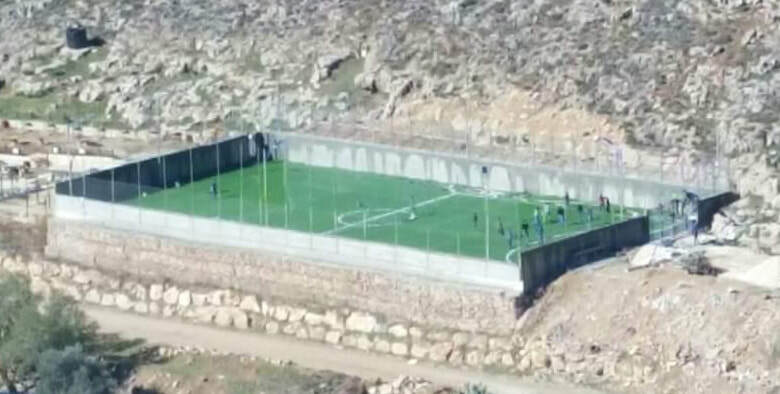 The Green Valley Club, a young men's soccer team fielded by the Wadi Foquin Youth Club, trains on the field for games with other teams in the West Bank. The nearby playground has also been expanded to the southern wall of the soccer field, providing space for large village meetings and for dancing.